Mayor Rahm Emanuel Wins Chicago Runoff, But Progressives Show a Force That Can No Longer Be Ignored | Democracy Now! a Chicago-based reporter who has been covering the city elections for In These Times. He is also the author of several books, including the New York Times best-seller, Nixonland: The Rise of a President and the Fracturing of America. Chicago Mayor Rahm Emanuel has won re-election in a hard-fought runoff against challenger Jesús “Chuy” García. Emanuel defeated García with a margin of around 55 percent to García’s 44 percent. Emanuel raised $23 million for the campaign, more than three times García’s $6 million. García, the son of Mexican immigrants, shocked the nation’s political establishment by forcing Emanuel into the runoff earlier this year. Emanuel faced public dissatisfaction over his closing of 50 schools in mostly African-American neighborhoods, his handling of a 2012 teachers’ strike, and the city’s high murder rate and levels of gun violence. We are joined from Chicago by Rick Perlstein, a reporter and author who has been covering the city elections for In These Times. AMY GOODMAN: We move from elections in Ferguson, Missouri, to Chicago. NERMEEN SHAIKH: Chicago Mayor Rahm Emanuel has won re-election in a hard-fought runoff against challenger Jesús “Chuy” García. Emanuel defeated García with a margin of around 55 percent to García’s 44 percent. Emanuel celebrated his victory Tuesday night. MAYOR RAHM EMANUEL: I have had the good fortune to serve two presidents. I’ve had the fortune of being elected to Congress. Being mayor of the city of Chicago is the greatest job I’ve ever had and the greatest job in the world. I am humbled. I am humbled at the opportunity to continue to serve you, the greatest city, with the greatest people, for the next four years. NERMEEN SHAIKH: Rahm Emanuel raised $23 million for the campaign, more than three times García’s $6 million. The race became a symbol for a national divide between the Democrat Party’s moderates and the less-well-funded progressive wing. Emanuel served as President Obama’s chief of staff. García was a longtime community activist and county commissioner who was born in Mexico. AMY GOODMAN: Joining us from Chicago is Rick Perlstein, a Chicago-based reporter who has been covering Chicago elections for In These Times. He’s also the author of several books, including the New York Times best-seller, Nixonland: The Rise of a President and the Fracturing of America. Welcome back to Democracy Now!, Rick. Talk about the significance of the victory last night for Mayor Rahm Emanuel and also the showing for Chuy García. RICK PERLSTEIN: Well, the word that the mayor used in his speech was “humbled,” and it’s our hope among the progressive populace of Chicago that he truly is humbled and that he’s not going to kind of double down and become more authoritarian and try and raise, you know, $60 million for next time, because Chuy García really pulled together the elements of the activist community in Chicago in a way that really cemented gains that have been going on in Chicago for the last few years, that really started with the Chicago teachers’ strike, and really made sure that the powers that be in this city know that they cannot trifle with ordinary folks. That is a moral victory. Of course, we would have liked to have seen something better last night. NERMEEN SHAIKH: And this was the first runoff election in—for a mayor in Chicago’s history. So could you explain what the different levels of discontent were with Emanuel’s administration that led to the race being so close? RICK PERLSTEIN: Sure. It’s very interesting, by the way, that we have a runoff system. Much like the kind of segregationist South, they instituted a system after Harold Washington’s insurgent victories, that made it impossible to win unless you had 50 percent of the vote, a majority, not a plurality, and that was exactly to prevent insurgents like Chuy García from gaining power. 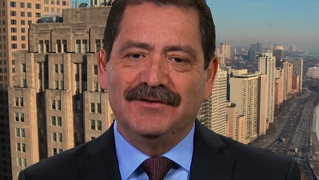 But Rahm Emanuel caused so much dissatisfaction that, you know, Chuy almost pulled it off. I mean, that was the miracle. People were dissatisfied with the way he closed schools in a very imperious and high-handed way without listening to the parents. They were frustrated at everyday things like potholes, and they were frustrated at the red light cameras he instituted as a revenue grab, as a regressive tax, and really lied about it, said it was about safety. The Chicago Tribune proved that it wasn’t making the city more safe, and proved that City Hall was lying about it. That kind of stuff really frustrated ordinary Chicagoans. And the stuff that really kind of galvanized the activist community was the fact that Rahm Emanuel just announced, almost officially, that they weren’t on his radar, that he was going to deal with the financial powers, and that was it. AMY GOODMAN: I wanted to go to Chuy García on Democracy Now! when we recently interviewed him. He talked about why he was running for office. JESÚS ”CHUY” GARCÍA: I’m running for mayor of the city of Chicago because Chicago needs to go in a different direction. For the past four years, we’ve seen Mayor Emanuel arrive in town with a boatload of money, impose his policies on the people of the city of Chicago. They favored a select few in Chicago. Through the amassing of large sums of money, he thought he could get re-elected, while leaving behind Chicago neighborhoods, making Chicago a city that leads the nation in the number of school closings—almost 50—and making Chicago, at the same time, one of the most violent cities in the country. AMY GOODMAN: So that was Chuy García on Democracy Now! Rick Perlstein, can you talk about who he was and the significance of this victory? AMY GOODMAN: —which shows how many people disapproved of Rahm Emanuel. AMY GOODMAN: And especially what this means for the Latino community in Chicago? RICK PERLSTEIN: Yes. One of the exciting things about this movement—and it was a movement as well as an election—is we saw the emergence of a national Chicano leader. Chuy García is a remarkable guy. He has a remarkable inner core of strength. He has been hanging on in Chicago reform politics since the 1980s, when other people sold out, fell by the wayside, were crushed by the machine. And here’s this guy who was born in Mexico, moved here when he was nine, came up through the ranks of Chicago reform politics, was an alderman, was kicked out of office by the machine, was a state senator. They ran a guy against him who was also called Chuy García, you know, that old dirty trick. And now he’s been doing great work on the county board. So this—really, what this means is, under the second Mayor Daley, the Hispanic community was co-opted into something called the Hispanic Democratic Organization, and that was really the seat of a great deal of corruption in Chicago. But now what we have is an independent reform force of Hispanic politics in Chicago that’s really joined with the African-American community in a way that we haven’t seen since the 1980s and Harold Washington. And one of the strategies of Rahm Emanuel was to try and exacerbate tensions between the Hispanic community in Chicago and the black community in Chicago, but the tensions were not there for him to exploit. They united. It was other factors that gave Rahm Emanuel his victory. It was the money. It was a media that really kind of read from Rahm Emanuel’s script. But again, another silver lining of this election is we see a galvanized Hispanic population, united with the African-American population, united with the white left, and that’s not going to go away. That’s a real permanent structure for Chicago. AMY GOODMAN: Finally, Rick Perlstein, you have written about, and we’ve been covering, this area in Chicago known as a black site, which is Chicago Homan Square. AMY GOODMAN: How did this controversy play out in the elections? How did the media cover it? Explain what it is. RICK PERLSTEIN: Basically, we have a police building in the middle of nowhere called Homan Square, where they take suspects and hold them incommunicado and basically do things that are tantamount to torture. And that was broken by The Guardian, the London paper, and the Chicago media was extraordinarily defensive at having been scooped by an out-of-town paper. And lo and behold, they basically tried to debunk the story and then completely ignored it after that. AMY GOODMAN: But a top guy left. RICK PERLSTEIN: A top guy left the Chicago Police Department. Well, there’s lots of reasons for top guys to leave the Chicago Police Department. And one of the extraordinary reactions of both the police and the media—this was supposed to be a defense—was, “Oh, what goes on at Homan Square goes on in lots of precincts, so, you know, it’s not a black site, because this is kind of like business as usual.” That was the defense. So, the Chicago police need a lot of cleaning up. And it’s not going to happen without this insurgent energy from below, which I think we’re going to see. You know, this movement is not going away. AMY GOODMAN: Rick Perlstein, we want to thank you for being with us, Chicago-based reporter who’s been covering Chicago elections for In These Times, author of a number of books, including Nixonland: The Rise of a President and the Fracturing of America. This is Democracy Now! When we come back, Tavis Smiley joins us about his, oh, many-decade relationship with Maya Angelou. Stay with us.